Isn’t it beautiful? This is my Trevi Automatica by Spidem – a fully-automatic espresso machine that will also froth milk, give you hot water instantly for tea or hot chocolate, heck – it does everything except the dishes. When we came home, we realized we’d settled for boring coffee for far too long. After intense online research and debate, we sent off for the Trevi Automatica by Spidem – all the way from Italy. It did everything – all we had to do was empty grinds, remember to feed it coffee beans and water, and clean it regularly. This coming May, we’ll have had that wonderful, fabulous machine for eight years. Its showing age – the noise as it grinds beans may be higher-pitched than it used to be. The buttons may stick, now and then. Hubby has been diligent in taking the whole thing apart, cleaning it, and putting it back together; we both have neglected to toss the overflowing grounds bin at times (which causes problems). We will hang onto this amazing machine until it coughs its last; but then what? I’ve never had a coffee maker last this long. I’ve never had a coffee maker that I’m SO attached to. You couldn’t pay me to go back to a 6-8-10 cup coffee maker. (The coffee at work is enough of a strain on my system!) And that one-cup machine, where you get the coffee pre-packaged (ground, or sludge, or whatever) and in whatever type you’d like (Dunkin Donuts, French Roast, hot chocolate, Chai) may be just fine on the set of a movie, but so not my style. There would always be that bunch of packets no one in the house would drink – and that translates to wasted money. I did some research – the Trevi Automatica is no longer imported. I guess the Italians decided to keep that yumminess to themselves and I don’t blame them. However…look what I found!!! It’s called the Vienna Plus, by Saeco. It looks like the Trevi Automatica. It holds water and grinds beans and steams milk. 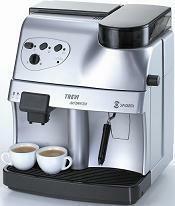 All the buttons and gadgets are in the same place as for the Trevi – basically, it is the perfect copy of the Trevi . To my total shock, it costs about the same – maybe even less, since we’re not shipping it from Italy. How could we go wrong? So, when the Trevi is ready for that machinery-bits-and-parts bin in the sky, we’ll know where to go to get our new coffee maker. Fresh coffee, from fresh beans and water, brewed just for me. Okay, and for the Hubby. Life is good! This entry was posted in Life, Uncategorized and tagged Blogging, coffee, demon soul, fresh beans, Keurig, Saeco, Spidem, Trevi Automatica, Vienna Plus, writing. Bookmark the permalink. Can you believe the silly 10 cup coffee pot we got for our wedding still works? Probably because we don’t use it that often. I buy my coffee when I’m out of the house. Awww… I’m glad you found the perfect replacement for when it’s time. Even though I don’t like coffee, I LOVE soft serve ice cream and if I could find a machine that made soft serve taste like it does from McDonalds, I would be in trouble. As it is, there isn’t one day that goes by that I don’t eat ice cream in some form. You’d think I was 5. Yeah, I’ve only had dairy queen a couple of times and it was memorable. They had one inside the Santa Anita mall, but they took it out a year ago. That made me sad. Btw, you’re cute too: “My love affair… Isn’t it beautiful!” you had me cracking up! Have you tried making ice cream at home? When I was pregnant with my first, I spent all summer making fresh strawberry ice cream. Couldn’t get enough of it! Lovely. Must go and research it. Maybe if the kids chipped in for mothers day…. 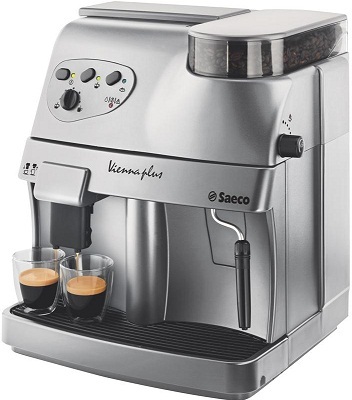 It runs at $599, but my hubby found it for $200 less just by looking around and doing a search on the Saeco. I fully believe its the best investment (bar putting a new roof on our house) that the two of us have made in the past ten years. Good luck talking the kids into it! I adore Yasmine – but I didn’t know her eight years ago, lol! My main thing was, I didn’t want to do any grinding of beans or tamping of grounds – we’d had a small espresso maker that you had to jump through hoops to use and I didn’t want that. The Trevi is fully automatic, which is why I love it. But I will say, I’ll look into the Breville Roma – if both you AND Yasmine like it, then I’d better take a look-see! Thanks, Catie!